In the end, AzhwAr says “Those who practice this decad will be freed from the eternal torment of senses to the AthmA“. Subsequently, AzhwAr says “For those who sing this decad joyfully with its meaning, all sins will be eliminated”. pOm – will be freed. emperumAn is manifesting himself as three distinguished individuals with the forms having adequate qualities to perform creation, sustenance and annihilation; being the root of all these, as known in scriptures, he is resting in the causal ocean with the lotus flower on his divine navel; nammAzhwAr is the servitor of those who are related to in a chain of servitors of such emperumAn; he spoke this decad among the thousand pAsurams; those who can sing this decad with the meanings, being triggered by love, at all times whether day or night, will be freed from sin which puts hurdle for experiencing bhagavAn. koNda mUrththi Or mUvarAyk kuNangaL – “guNangaL koNda mUrththi Or mUvarAy” – being the three individuals having the form matching the qualities such as sathva, rajas and thamas. Creation etc which match the particular quality will manifest in each of those forms. Among the three forms, in two forms [brahma and rudhra], he pervades through other jIvAthmAs. padaiththu … – Engaged in creation with rajO guNam, annihilation with thamO guNam and protecting all of these with sathva guNam. appuNdarIgam … – AzhwAr is speaking about emperumAn‘s lying on the causal ocean to do all of these. Only for the benefactor who reclined himself on the causal ocean to engage in the creation of the universe, with the lotus flower in his divine navel which is well known [as the source of creation]. By “appuNdarIgak koppUzh“, emperumAn being the cause and brahmA and rudhra being the effect is explained. The creation of one individual [brahmA] only needs to be proven; as said in vEdham “brahmaNa:puthrAya jyEshtAya SrEshtAya” (rudhra, who is the eldest son and the best), the creation of other person will be naturally explained. After saying in nAnmugan thiruvandhAdhi 1 “nAnmuganai nArAyaNan padaiththAn” (SrIman nArAyaNa created brahmA), thirumazhisai AzhwAr would further explain the creation of others. In this manner, this is explained by vEdham as well as vaidhikas. thoNdar … – To overcome the anguish of meditating upon the sensual pleasures and the senses, AzhwAr is focussing on the ultimate state of SEshathvam (servitude) [i.e. servitude towards the devotees of emperumAn and their devotees]; just as someone who experienced heat will delve deep into a pond to refresh himself. kaNdu pAda vallAr – Can those who meditate upon AzhwAr‘s state, sing? [No – they will also melt]. kaNdu – Considering these pAsurams to be our refuge. vinai pOm kangulum pagalE – Sins [which cause attachment to senses] will be eliminated from day and night. Difficulties explained in thiruvAimozhi 7.1.2 “irAp pagal mOdhuviththittu” will be eliminated. 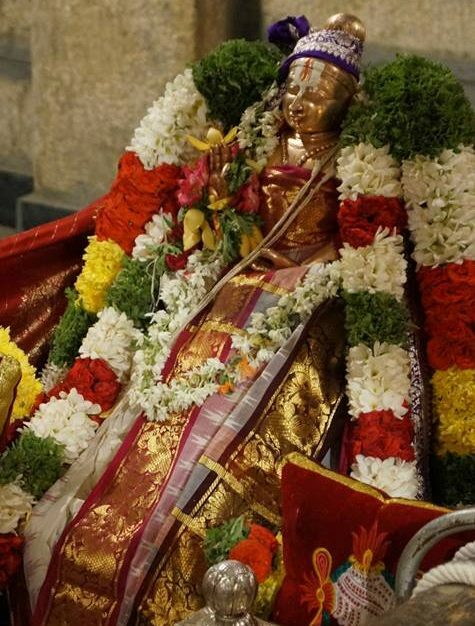 This entry was posted in thiruvAimozhi, thiruvAimozhi 7th centum on July 19, 2018 by Sarathy Thothathri.